IS THE STAINLESS STEEL BOTTLE I RECOMMEND. Stainless steel water bottles are BPA-free. BPA stands for Bisphenol it’s used in the manufacture of plastic products and can disrupt the natural function of your hormones. A quick way to check is to look inside the bottle to see if there is any kind of plastic lining. BPA-free bottles are also recyclable for those of you who are environmentally friendly. Single-Walled bottles are made of one layer of stainless steel. This allows you to actually use the bottle to boil water for those who, like myself love the great outdoors. These bottles tend to be cheaper but are also less durable and more prone to dents when dropped. Double-Walled bottles are exactly how they sound. They are made of two layers of stainless steel. Helping it to preserve the temperature of your liquid whether it is cold, or hot. Vacuum-Sealed bottles prevent the outside of the bottle from becoming too hot to hold. These bottles also do an excellent job of maintaining cold temperature of its contents, some even 24 hours later and for hot contents such as coffee or tea, can last up to 12 hours. This Technology stops the outside of the bottle from having a wet layer so there will be a dry surface each time you grab your bottle for a refreshing sip. Leak-Resistant can be VERY important if the new bottle is going in your book-bag with another irreplaceable item such as laptops, phones, and any other electronic devices. There are several types of lids some spring or pop up. While they can be faster to get into, the most durable caps will be the stainless steel ones that screw in. Water capacity is how much liquid the water bottle holds. They can come in all varying sizes 9-32oz. Now Amazon does sell a 40oz bottle, if you must have that extra water. Anyway, somewhere in the 20-27oz range will keep you hydrated for hours as well as maintain a weight that is reasonable to carry around all day. This means the stainless steel they use is the same grade of steel that they use in restaurants and cooking appliances. Pretty much all bottles for sale will be FDA approved but it’s something to keep in mind. The most generic are the steel colored bottles but most company’s offer many colors and designs along with different shapes and sizes. 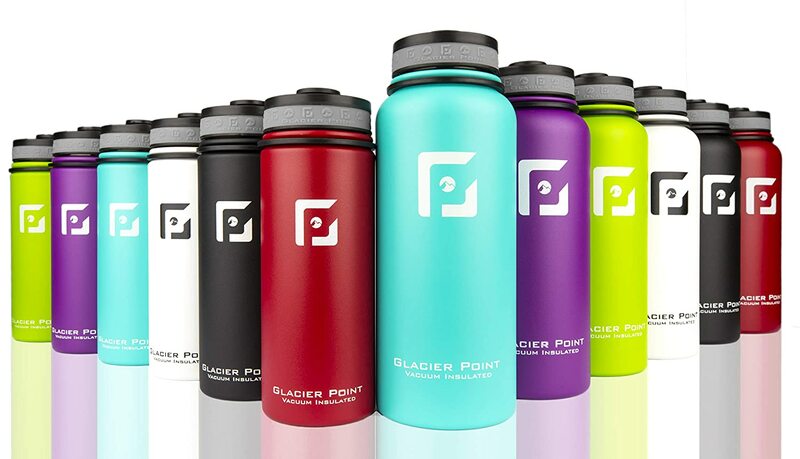 Glacier Point is the stainless steel bottle that I recommend. They have come the closest to meeting the standards I have been talking about. Not only does it meet the necessary requirements for safety and style. The price is great for the value and to top it off it comes with a Lifetime Warranty! Hope you enjoyed my article maybe you learned something. Hit that like button and share the post! If you have any questions please feel free to do so in the comment box below. Have a great day! Avoiding plastic in what we use to eat and drink with is a great idea. I’ve been on the lookout for a great new water bottle for awhile. Thanks for the recommendation! You got that right Holly! And not a problem I actually quite enjoyed my search for the best all around bottle and believe I reached a good verdict. These water bottle look extremely well built and colorful. I like the fact that they are double walled and leak resistant. One of things you point out is that they keep liquids cold for 24 hours? That’s important to me because when I go out I like to take water with me and I can only drink it cold. I don’t like it when it gets warm. That alone sells me of the Glacier water bottle. How long do these bottle last? Oh me too cold water is the only way to drink water. But yeah I’ve done research on the vacuum sealed technology they run tests leaving them in cars, lockers, etc. for periods of time and some have small chips of ice up to 24 hours later which is more than enough time because you should be re-filling that bottle a few times in a 24 hour span. This bottle has a lifetime warranty for any workman defects as well as material defects. It comes with a bonus straw cap but I would just use the stainless steel lid if your looking for the most durable use. Hope this helps! And Rob stay classy my friend. I didn’t know about this bottle It seems like it is the perfect one for me. I’m really bad for drinking water so I have to carry a bottle with me anywhere I go to remember to drink water but I hate that it’s all sweaty or does not maintain the temperature. Thanks for posting this! The bottle pandemic solved! (: thanks for the comment and yeah I’ve been checking around for a couple days now this is the best for the value I’ve come across. $12.99 for a double skinned food-grade stainless bottle is a steal. They are considerably more expensive in the shops in my country. My previous bottle was lost, and then found crushed by my electric car seat. A sad end to a long partnership. I will be getting a new one and thank you for pointing out the important features that I should be looking for. I thought the same! When I first posted it they were $19.99 and I though well that’s reasonable for a solid state of the art bottle with a lifetime warranty because I’ve seen upwards of 40 dollars/bottle then I check it again and see the discount and I’m shocked I had to hurry up and change the ad lol. So the links don’t update themselves I’ve found out. Thanks for the comment again Andrew always a pleasure. Just wanted to drop you a quick thank you. You totally shed some light in an area I had barely payed any attention to. I totally hate when these kinds of bottles can’t be sealed properly. I had one that I simply got from the supermarket next to my place, and in about a half of a year it turned out to be such a disaster. I literally had to put it in a separate sack and then only I could put it in my backpack. It’s because it leaked. Of course, initially also some of my books got pretty badly damaged. Nonetheless, I decided to get rid of that thing and your recommendation seem like the perfect fit. Thanks Matiss and sorry to hear about the books. It’s always a pain to lose a book to water damage and I hope your new bottle will treat you much better. Cheers as well and same to you! This looks like a great water bottle choice. I head to the gym everyday, and I do have a water bottle. But it does not stay cold at all, and I really could use a good one. I am wondering if this will keep the liquid cold for a good amount of time? Thanks for the comment Matts Mom!! My friends all love their stainless steel bottles. There’s all look the same though. Your Glacier Point ones look different so I can stand out more, I like that!!! I here so many good things about stainless steel bottles. Thanks!!! Got to stand out! No problem Bruce and thanks!